One of my favorite images (and thoughts) on success: what people see vs. what they don't. The iceberg can represent someone who has achieved their own version of success. We all see the tip of the iceberg: the outcome of the actions, the hustle, the execution of an idea, and thus...the accomplishments. Unnoticed though - and below the surface - are the efforts, the strain, the early mornings and even later nights. The blood, sweat, and tears. 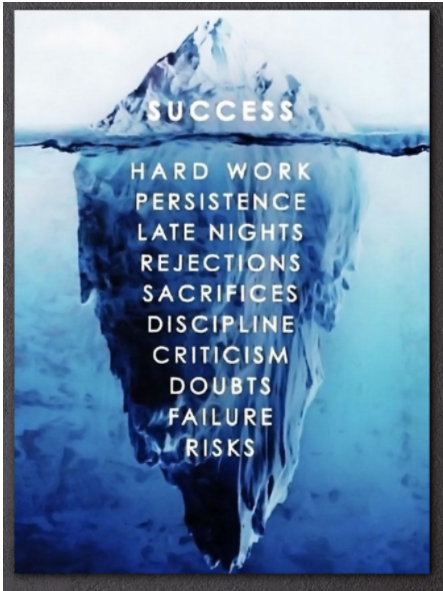 And yes, this is the largest part of the iceberg, the biggest key to success and what ultimately takes up the time and the effort in the marathon that is success. People may see the tip of the iceberg and believe that it can be so easy, and that they can accomplish their goals to reach their success, without knowing the real process that's 'in the water' below. Every successful person has had to put in a ton of effort, determination, and persistence to attain their level (and their version) of success. ...now get back to work.